For growing maritime nations like Indonesia and the Philippines, planning for integrated liquefied natural gas (LNG) receiving terminals and gas-fired generation is a timely solution to balance the power generation mix and help meet 2015 Conference of Parties (COP21) commitments. Both nations are vast archipelagos together totaling some 350 million people. Prospects for economic growth remain strong while full electrification remains a focused goal for both nations. Unlike its economic neighbors – Thailand, Singapore and Malaysia – coal has remained the predominant fuel choice for these two large developing nations. Cost-sensitivity, abundant supply and under-invested gas distribution infrastructure across their many islands are some of the key factors that maintain coal's predominate status. Developing coal plants, in many ways, is logistically simpler and the advent of more efficient coal technologies continues to improve the economics. For gas-fired generation development to gain momentum, a combination of forces must be in play to help overcome existing barriers. 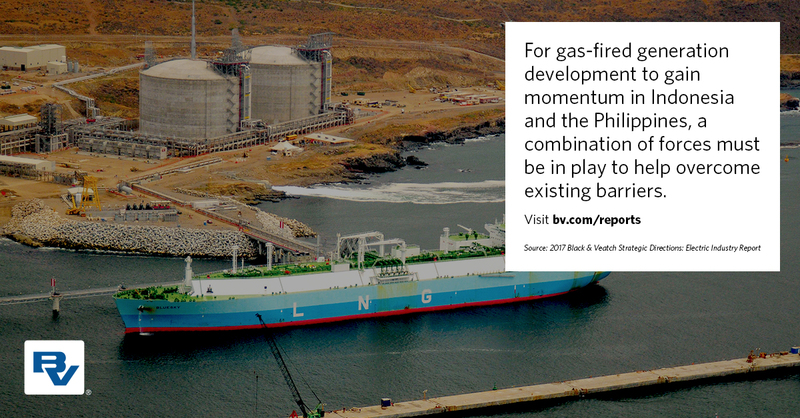 Access to the gas supply remains a primary challenge for gas-fired generation and, for island nations, this means more LNG infrastructure development is required. Liberalization of LNG trading that is underway in the region points to the potential of mid-scale receiving terminal development; it could also spur lower trading costs for gas that more accurately reflect the prevailing market forces of oversupply. Since oil prices slumped, financing of LNG infrastructure has stalled. However, this is where co-locating mutually dependent electricity infrastructure can play a timely role in Indonesia, the Philippines and elsewhere in Asia. It is a proven way to optimize cost and improve project economics but it demands additional planning, strong government cooperation, and engagement of non-traditional gas sector stakeholders. 1. There is an appetite for alternative thinking that unlocks the right price point for LNG project financing. Integrated planning of LNG and combined cycle power generation will provide a significant cost reduction that can help projects meet numbers and more readily secure the final investment decision. Asia accounts for 73 percent of global LNG demand according to the International Group of Liquefied Natural Gas Importers (GIIGNL), yet the trade of LNG throughout the region is still limited. Many nations want greater access to more abundant and cheaper natural gas supply. 2. LNG trading in Asia is on the cusp of change. The diplomatic isolation of the world's largest LNG exporter, Qatar (as at the time of this writing), the arrival of new LNG cargoes from LNG developments in Australia and North America and the efforts to create LNG trading hubs in China, Japan and Singapore are combining to unlock restrictive terms included in most of Asia's long term supply contracts. These forces could in effect help catalyze LNG market liberalization in Asia, shortening and loosening long term supply contracts and boosting spot trade. This liberalization would increase the affordability of gas in the region while also strengthening the case for smaller and more distributed LNG receiving terminals in locations such as Indonesia and the Philippines in the near term. The first wave of development would lend itself to utilizing some of the LNG supply for combined cycle generation with business cases for electricity supply potentially easier to establish ahead of alternative processing uses. 3. Gas-fired power generation will help meet energy security and environmental policy goals. Increasing the proportion of renewable energy as part of the generation mix will take many developing nations time given the technical issues such as pricing of storage and integrating intermittent renewable sources. Therefore gas-fired power generation can contribute to reducing proportional CO2 emissions, help nations make progress on COP21 commitments and improve energy security by diversifying fuel supply. Locating new gas-fired power projects at the source of LNG supply presents solutions that should elicit central government support.